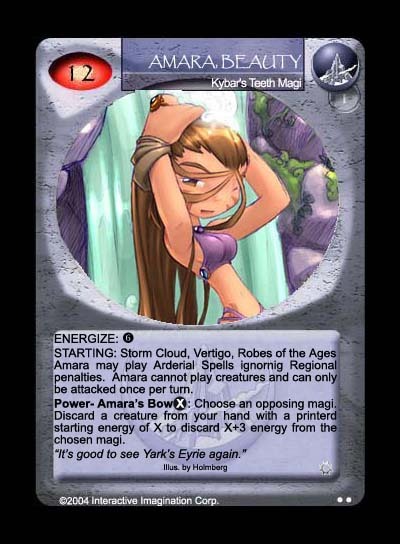 Amara, Beauty was one of the last card designed for the set and has received some flak due to players who think she should be in Arderial. Well, she's not. Here she's a KT magi and has been created based on the fiction by Amber on the official site - summoning creatures are alien to her, but she gets to play some of the most powerful, presumably Arderial, spells, and has a bow. The art is one of her at the waterfall with Ora besides her, done by Holmberg.